WASHINGTON (CNS) — When Lent begins March 6, U.S. Catholics will likely be more than ready for it. Ash Wednesday, the start of Lent, is typically a big Catholic draw, filling churches with nearly Easter- or Christmas-size Mass crowds even through it is not a holy day of obligation. Conventual Franciscan Father Jude DeAngelo, director of campus ministry at The Catholic University of America in Washington, hopes this year is no exception. “We in the American Catholic Church have been through a year of tremendous suffering and tremendous upheaval and frustration” he told Catholic News Service, referring to the past months of allegations of sexual misconduct and cover-up by church leaders. 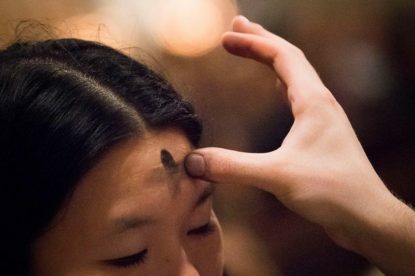 By its very nature, Lent has an overall aspect of penitence to it, but that shouldn’t override the whole season, said Paulist Father Larry Rice, director of the University Catholic Center at the University of Texas at Austin. His recommendation for this year’s Lent is “to do what the church has always asked us to do: prayer, fasting and almsgiving” and that concentrating on those things will bring people closer to God and one another. “I think it’s important to make some distinctions that might rescue Lent for people this year,” he said, noting that it’s not “supposed to be about sorrow, sadness or anger, which people are justifiably feeling,” in the current church climate. “That is not what Lent is about,” he said, stressing that it should be a personal preparation for Easter. This Lent, “we don’t put reparation on hold, we just get to do both” — personal penance and reparation, he said. Sister Teresa Maya, a Sister of Charity of the Incarnate Word based in San Antonio, said she has been moved by the expressions of reparation by priests in her archdiocese taking “collective responsibility” for abuse and any cover-up in the church. The sister, former president of the Leadership Conference of Women Religious, an umbrella group of 1,500 leaders of U.S. women’s religious communities, said it is important for the church to begin with reparation, but it can’t end with that. “To live in the spirit of Lent there has to be path away from personal and systemic sin” that led to this crisis, something she said she hasn’t seen yet. Sister Maya said the sacrament of reconciliation, which is talked about a lot in Lent, centers on listening and the church still needs to make it a priority to listen to abuse survivors, but Catholics also need to listen to one another. That’s where Lent once again comes into play, because she said it provides a time for people to examine where they are personally but also can raise the question “Where are we?” as the Catholic Church in the United States. And no matter where you fit in the church, as a leader, family member or parishioner, she said the question of what’s next feels different; it’s not the same as it was when the church went through the sexual abuse crisis nearly 20 years ago. She likened the church now to the time when the apostles were in the upper room wondering what to do next. This is a “critical moment” to return to the core of what Catholics believe, she said. Father DeAngelo similarly stressed the need for Catholics to keep going and to support one another. Chaz Muth contributed to this story.